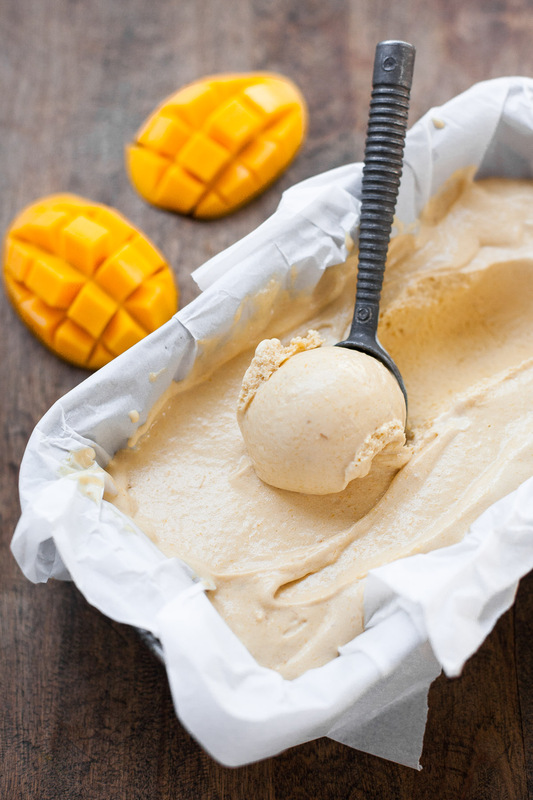 This mango curd ice cream is rich and refreshing at the same time, and perfect for taking advantage of peak mango season! Have you spotted any champagne mangos (also known as ataulfo or honey) in stores recently? They’re my absolute favorite. They’re the smaller, golden-colored mangos, and I find their flavor sweeter and cleaner than their larger, red-skinned counterparts. (I didn’t take a picture of the whole mangos this time, but you can see what they look like in the photos for my stuffed avocados with shrimp and mango.) Their flesh is also less fibrous than other mangos, which makes them an ideal choice for whipping up a smooth curd that will eventually become mango curd ice cream. Making mango curd is easy, and it’s a wonderful addition to my relatively large collection of fruit curds. I start by pureeing mango chunks to yield the golden nectar you see below (an immersion blender makes cleanup super quick). 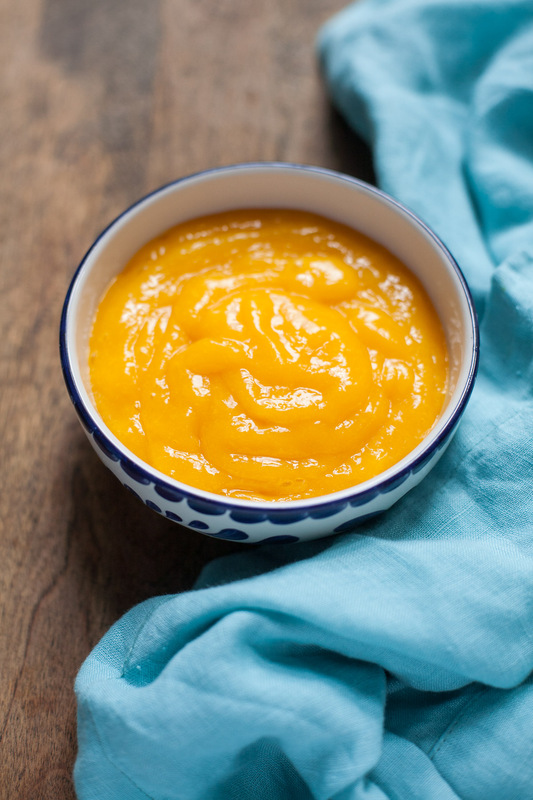 The mango puree goes into a saucepan with raw sugar, a few egg yolks, a couple spoonfuls of lime juice, a splash of vanilla, and a pinch of salt. Next, I whisk it over medium heat until it’s cooked and thickened a bit. Since the mango puree is so thick to begin with, the change isn’t as dramatic as with other curds, so I like to use a thermometer to keep track. When the temperature is between 150 and 155°F, it’s done. If you don’t have a thermometer, watch for plenty of steam rising from the edges of the pan, but don’t let it actually start to bubble. 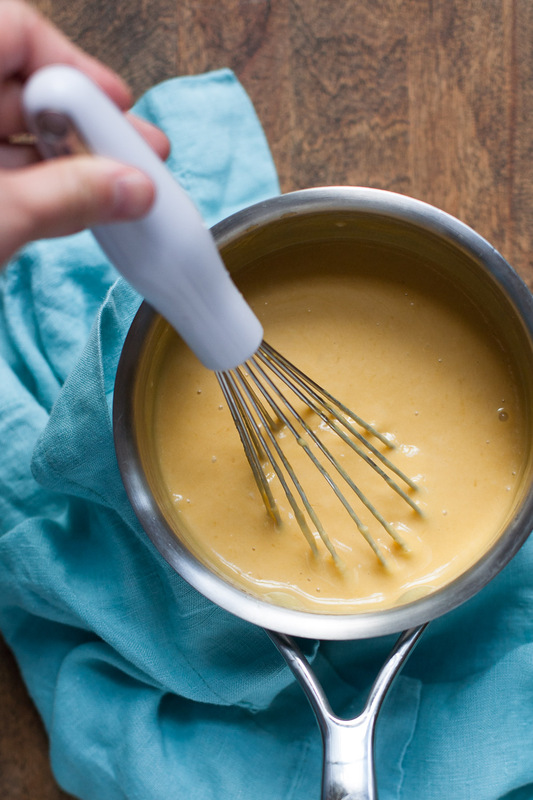 Turning the mango curd into the base for mango curd ice cream is the simplest part of all: just whisk in heavy cream! I haven’t tried a dairy-free version of this using full-fat coconut milk, but I bet it would be wonderful. I’ve made similar ice creams with coconut milk in the past before discovering my coconut milk allergy (like this pumpkin spice and this strawberry one) and they always come out great. Once the mixture has chilled until totally cold (at least four hours–you can’t rush this part!) I churn it in my ice cream maker. I haven’t yet tried a no-churn version, but if you don’t have an ice cream machine, here’s what I’d try. Chill the curd completely (without mixing the cream in). Whip the cream until it holds medium peaks. Gently fold the chilled curd into the whipped cream, spread into a container, and freeze until firm. 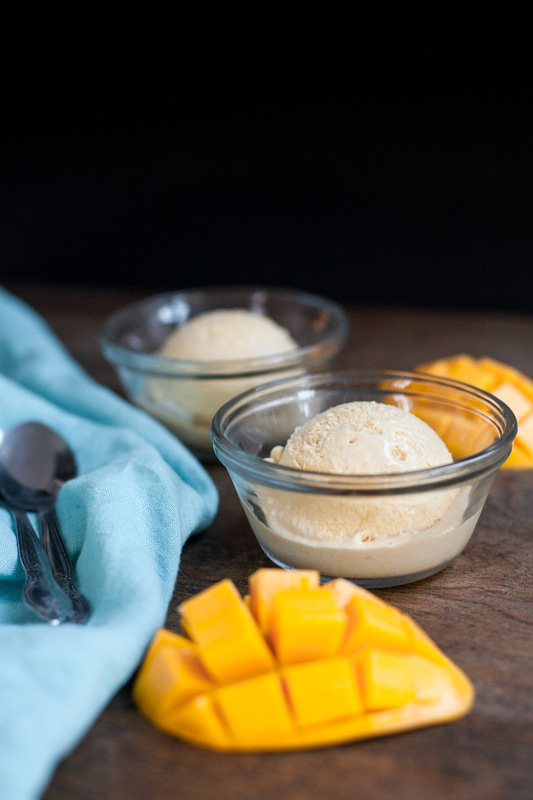 This mango curd ice cream is going to be my frozen treat of choice all summer long. I love the balance of sweet, tart, rich, creamy, and fruity flavors. Let me know if you have a chance to give this one a try! NOTE: Prep time does not include four hours for the ice cream mixture to chill before churning. Puree the mango chunks with an immersion blender or regular blender until smooth. You should have about 1 cup of mango puree. Combine the mango puree, raw sugar, lime juice, vanilla, salt, and egg yolks in a medium saucepan over medium heat. Whisk constantly until the curd thickens, about 6-8 minutes (it should measure 150-155°F on a candy thermometer). Remove from the heat and continue to whisk for about 30 seconds more. Strain if desired (I recommend straining the curd if your mangos were at all fibrous—more likely to happen with red mangos). Whisk in the cream. Refrigerate the mixture until completely chilled (at least 4 hours or up to a day). Freeze in an ice cream maker according to the manufacturer's instructions (I have this Cuisinart ice cream maker and love it). Serve right away for soft serve, or transfer to a container and freeze for at least 2 hours for scoopable ice cream. *You’ll need about three champagne/ataulfo mangos (the small, yellow ones—they’re my favorite but can be hard to find!) or two large red mangos to get the right amount of pulp. Would using agave or stevia instead of raw sugar change anything in texture? Not sure about stevia–I don’t use it so I’m not sure how it would go texture-wise–but agave might work. I’ve used honey to make curds before and agave behaves similarly. (Here’s my honey-sweetened blood orange curd in case you’re interested: http://acalculatedwhisk.com/blood-orange-curd/) Let me know how it goes if you try it! These are my fave mangos, definitely trying this. Champagne mangos are the best!!! Hope you love it. This looks delicious! Do you have a dairy free version of this? It should work with coconut milk! Holy crap you had me at champagne mangoes. Those are my absolute FAVORITE!! Mine too! Worlds better than other mangos in my opinion! I LOVE Mango !! 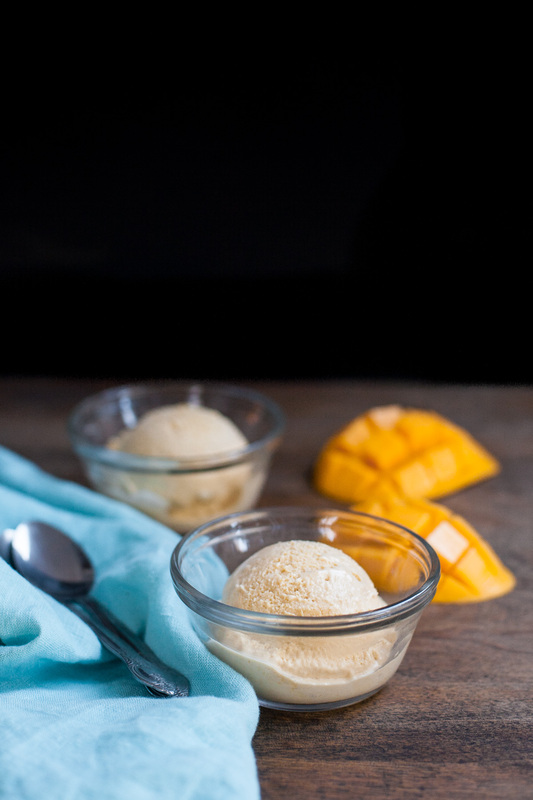 This mango flavored ice cream looks so creamy and smooth ! YUM !!! I Love Mango! This is such a great, creamy, sweet & refreshing ice cream recipe for Summer. Champagne mangoes are the best! I’m completely addicted to lemon curd but I’ve never tried it with mango before, it looks fantastic! Going to give this a try using coconut milk. Looks gorgeous, and I love the flavour combo of mango and lime, too. Thanks for a great post! This looks so creamy and delicious! The perfect ice cream to start out the summer! daaaayyyuummmm that looks so creamy and divine. Do you think I could use coconut or cashew cream? I think coconut milk would work! I mentioned in the post that I haven’t tried it with this recipe because of my coconut allergy, but it’s worked in lots of similar recipes. I’ve been mango crazy lately (my oldest son is ALWAYS mango crazy) and will have to add this one to my list of things to try for sure. This looks amazing!! Love mango anything. Do you think full-fat coconut milk will work in place of heavy cream? I think so! I mentioned in the post that I haven’t tried it with this recipe because of my coconut allergy, but it’s worked in lots of similar recipes. This looks so good! I am all about ice cream this time of the year (actually, I love ice cream year-round), especially refreshing fruit flavors like this. I would love a few scoops of this! Yum! I’m an ice cream all year person, too, but definitely make it more often when it’s warm out. This one tastes so tropical and summery! Oh my that looks amazing! My ice cream maker broke last summer and I’m planning on getting that Cuisinart one for this summer! It’s great! I just love being able to make my own ice cream! Hi Jay, I have no idea! As a home cook, I don’t know the considerations that go into choosing a recipe for commercial purposes. Hope you give the ice cream a try, though! Becky, within the body of the recipe you state, “I have this Cuisinart ice cream maker and love it”. I don’t find a link or description of you IC maker. There are several to choose from, but I trust which one you love! Please tell me which one you use? Thank you! And I practically swooned when I saw all your ice cream recipes!! I can’t wait to start making these! Sorry about that, Merry–I added the link! Let me know what you think when you try this or any of my other ice creams! This looks soooo heavenly! I’m a huge fan of mangoes (I’ve never seen champagne mangoes, but now I’m in hot pursuit of them! ), and the texture of this ice cream looks supreme! Well played, m’dear! Thank you so much, Julia! Champagne mangos are totally worth hunting for! This looks absolutely delicious, Becki! I will have to make it soon…and I bet it will be great with peaches, too! Definitely! I was thinking the same thing about trying it with peaches!